As if the return of figment isn't grand enough, two beloved attractions will be returning to Tomorrowland. Word has it that the Carousel of Progress will open beginning June 9th from 11AM-5PM daily. Timekeeper makes his grand entrance a day later beginning June 10th from 10AM-6PM daily. Disney has announced their Resort Fall Savings. If you are vacationing at Walt Disney World between 8/25/01 and 10/02/02 you can take advantage of this special. Book before July, 08, 2002 and save $18 - $75 per night on lodging. Value Resorts listed from $59 and Moderate Resorts from $89 per night. Stay in a Deluxe Resort from $129 per night. Rooms available at these rates are limited. Call INTERCOT's Exclusive Travel Agency Kingdom Magic Travel today at 1-800-425-0306 for more details. Tell them you saw the special on INTERCOT and ask for code CQT. The official opening date of "Journey Into The Imagination With Figment" is set for this weekend. Countless fans of the original ride will soon find out whether 8 million dollars and a crew of 100 Imaginers is enough to give the once cheerful ride and pavilion back it's long lost... imagination. Union activists began picketing May 28 in front of the Walt Disney World Swan and Dolphin hotel, whose Teamsters-affiliated housekeepers, laundry workers, seamstresses and public area attendants voted last week to strike. However, according to a spokeswoman, all regularly scheduled employees showed up for work on Tuesday. The hotel has not had to implement a contingency plan, and guest services have not been disrupted. The Swan and Dolphin Hotels are operated by the Starwood Corporation. Plans are in the works at Disney-MGM Studios to retrofit the motion-simulating Star Tours ride with a new short film. The current film, part of the attraction when it opened in 1989, depicts characters and scenes from only the original three Star Wars movies, and not more recent prequels including the latest, Star Wars: Episode II -- Attack of the Clones. 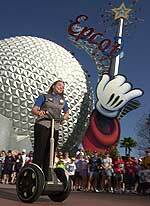 Walt Disney World Resort and Segway LLC have partnered for the first public display of the Segway™ Human Transporter (HT) at Innoventions at Epcot, the ever-changing theme park of discovery. Guests can now see this innovative short-distance transportation technology firsthand through a display inside of Innoventions, which includes interactive stations and daily demonstrations on how the product works. Star Wars Pins Land Early! The Star Wars Pins have landed EARLY at the Walt Disney Parks and Resorts! These new OPEN edition Star Wars Pins have arrived ahead of schedule and just in time to celebrate the release of the latest Star Wars film, Episode II: Attack of the Clones. Beginning this Friday, May 17th, 2002, at the Walt Disney World Resort, in Orlando, Florida and the Disneyland Resort, in Anaheim, California will be launching several styles of Star Wars pins, exclusive to the Walt Disney Parks and Resorts. Traders will be able to find plenty of these unique pins at Star Trader (at the exit of the Star Tours attraction) in Tomorrowland, The Tomorrowland Pin Cart and Showcase shop on Main Street U.S.A. at the Disneyland Resort in Anaheim, California. For Guests visiting the Walt Disney World Resort in Florida, the pins can be found at the Star Tours attraction at the Disney MGM Studios. The Disney-MGM Studios will play host to the Seventh Annual ABC Super Soap Weekend November 9 & 10. All My Children star Susan Lucci will headline an outstanding lineup of stars from the ABC Daytime dramas. Your favorites will be on hand for autographs, photos, musical performances, star conversations and more. Disney-MGM Studios admission required. Celebrity appearances subject to change. Cinderella's Surprise Celebration will not be performed this week. The Castle Forecourt Stage is undergoing refurbishment. However, performances will resume again on Monday, May 20, 2002. The Character Greetings in the Castle Forecourt area are unaffected. Greets are scheduled daily from 9:50 a.m. to 2:00 p.m. & 4:00 p.m. to 5:15 p.m. Storytime with Belle and Sword in the Stone will also be performing on a daily basis throughout the week, to compensate for the temporary closing of Cinderella's Surprise Celebration. The Great Movie Ride" at MGM, is offline for maintenance for this week and will be back up and running on Monday, the 20th. From the creator of the Tony Award-winning Broadway hit Blast! comes SHOCKWAVE. Last year, critics hailed Blast! as “rhythmically intoxicating” with “sound and motion from front to finish” and this year SHOCKWAVE promises to bring an all-new combination of raw power and musical pageantry to Epcot from June 15 through Aug. 23. This dazzling performance is filled with sights, sounds and boundless energy -- all included in Epcot admission.